1101 stainless steel Hall-effect sensors provide digital pulse output signals, and are designed for use with magnetic targets such as 60 Pole Pair Magnet Wheels, Pulser Wraps, or Pulser Discs. 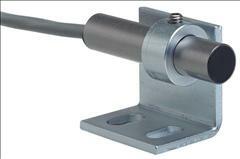 The 1101 sensor is the recommended Hall-effect sensor for use with Electro-Sensors NEMA C Flange Ring Kits. Sensors can be mounted up to 1500 feet from the control unit, ie. speed switch, tachometer, etc. 1101 Hall-effect sensors can be powered by 5-25 Vdc, have NPN open collector outputs, and are switched high and low in the presence of alternating magnetic fields. This provides a digital square wave signal with a 50/50 duty cycle when used with pulse generators that have evenly spaced magnets of alternating polarity. The gap distance between the sensing surface and the pulse generator is dependent on the strength of the target magnets. The signal produced by the 1101 sensors is compatible with most PLC Digital I/O cards and with other products requiring a digital pulse input signal.